Turns out we were way off on this whole car of tomorrow business. According to BMW the car of tomorrow is a form-fitting suit with unflattering horizontal lines and ball-bearing shoes. 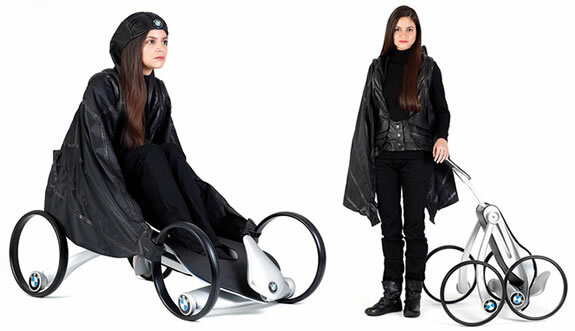 Or, maybe it’s a kind of bat winged jacket that attaches to a collapsible scooter… thing. That one’s called Flymag, pictured above, which converts into a backpack and apparently makes you FOF when you sit on it. These concepts and more are courtesy of FDI, the International Design School in Barcelona, and are on display through the end of this month at Rambla de Catalunya. Go see them now before they’re relegated to the annals of yesterday’s crazy visions for tomorrow.